But does increasing the AC temperature result in substantial power savings? A common misconception is that setting the thermostat at 18 degrees will cool down a room faster. However, that’s not true. It will take the same amount of time for the room to reach 26 degrees—which is significantly cooler than the average current outdoor temperature of 40 degrees in Delhi—whether you set the temperature at 18 degrees or 26 degrees. Of course, 18 degrees will be much cooler than 26 degrees, if that’s what you prefer. But you pay a price for lower temperature. When you set a lower temperature, the AC compressor works longer, which means more power consumption. On the other hand, if you increase the temperature to, say, 24 degrees, the compressor will work for much less time, leading to less power consumption. Once the desired temperature is reached, the compressor stops functioning, and only the AC fan works. The compressor restarts once the thermostat detects increase in temperature. “At 24 degrees, we are comfortable, even in high humidity situations, and the amount of energy used is much less than what it would have been at 18 or 22 degrees," said Ajay Mathur, director general of TERI (The Energy & Resources Institute). Prasanto K. Roy, 51, a technology policy professional whose home in south Delhi was India’s first TERI GRIHA green home, has witnessed significant savings in electricity bills by setting the AC temperature higher. Roy, who also has a condominium in Gurgaon, sets the AC temperature at 27 degrees during the day and moves to 28-29 degrees with a ceiling fan at low speed, if required, at night. “The bill that I get in my Gurgaon apartment is around ₹ 3,000. Comparable apartments in my building get electricity bills of ₹ 6,000-10,000. Though the apartment has six ACs, only about 1-2 are used at a time, but all are set at 27-29 degrees, which means that the compressors are mostly not on or are on only intermittently," said Roy. A study in India shows that we are acclimatized to be comfortable at higher temperatures of up to 29 degrees, provided other thermal comfort parameters are met, said Mili Majumdar, managing director, Green Business Certification Institute (GBCI) and senior vice-president, US Green Building Council. The perception of comfort is a cumulative of temperature, humidity and air velocity, she added. “Each degree increase in the AC temperature can save about 3-5% electricity," said Majumdar. 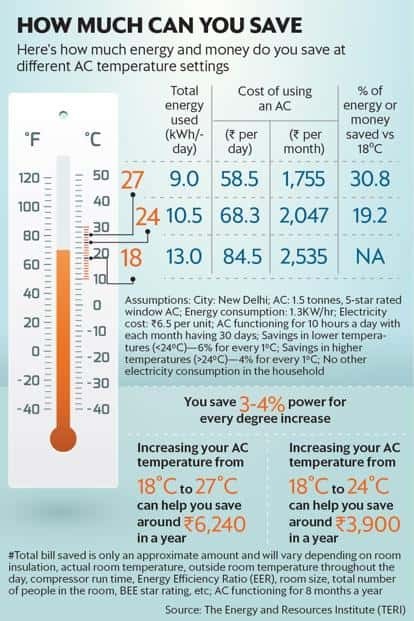 Increasing your AC temperature from 18 to 27 degrees can help you save around ₹ 6,240 in a year. Not only that, you also end up conserving 960kWh energy in a year (assuming your AC functions for eight months). The power consumption of an AC doesn’t just depend on the temperature you set it at. “How much power your AC consumes depends on its star rating, the outside temperature, the hours of usage, size of the room, number of people in the room, insulation in the room, etc," said Mathur. If you are setting the AC at low temperature and using a quilt or a blanket, it is not only unhealthy, it is also pure wastage of energy. Normal human body temperature is approximately 36-37 degrees and putting your body through extreme high temperature on the outside and low temperature on the inside can affect your health. So increase the temperature of your AC and keep it at moderate levels in order to not only conserve power, but also save on electricity bills.